The former site of Warren's Methodist Chapel (the first frame style meeting house of the Methodists outside of Memphis) and cemetery was sold in 1851 by Joseph and Matilda Warren Locke for $20 to the Methodist Episcopal Church South. At this time it became known as Pisgah. The earliest known burial was Sarah C. Bond in 1837. Rev. Reuben Burrow preached at Pisgah Church during the Civil War. An unknown Confederate soldier and many of the area's early families, Warren, Bond, Locke, Bartlett, McGowan and Crenshaws, are buried here. L. E. Dettwiller became Sexton in 1921 and served faithfully for 50 years. In 1972 Marion Hill Royer, a Bond descendant, succeeded him. 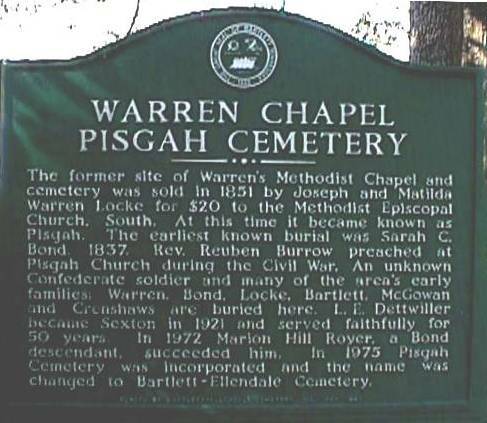 In 1975 Pisgah Cemetery was incorporated and the name was changed to Bartlett-Ellendale Cemetery. For additional information on the cemetery, its history and for some of those who are buried there, please contact the Bartlett Historical Society and ask to see the "Tombstone Inscriptions in Bartlett-Ellendale Cemetery" compiled by Jonathan Kennon Thompson Smith (copyright 2001). This volume (one single copy) must be viewed at the Gotten House. Formerly Union Depot "Stagecoach Stop"
Bartlett, located in Shelby County, is in southwest Tennessee adjacent to Memphis. It is the geographic center of Shelby County located along Highways 64, 70/79 and is served by Interstate 40 which connects with Interstates 240 and 55. The City of Bartlett is 18.5 square miles and is made up largely of middle-to-upper income families. 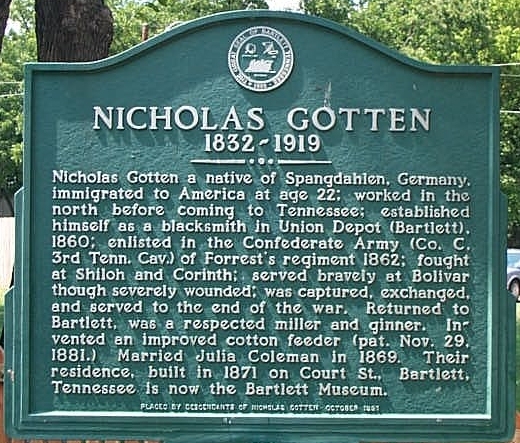 The City of Bartlett had its origin as Union Depot along the stagecoach route from Nashville. When the Memphis & Ohio Railroad took the place of the stages, Bartlett continued as a depot. In 1866, with a population of less than 100, the City was officially incorporated and the name changed to Bartlett. It was named for Major Gabriel M. Bartlett, a physician and planter whose estate was one of five major plantations on Stage Road. In 1855 the first school, Blackwell School, was chartered and by 1887 had an enrollment of 100 when the population of the city was only 300. In 1919 each citizen spent eight days per year at manual labor to build and repair the roads. This public service remains through the years as citizens voluntarily perform numerous jobs for the City even today. In 1993 the Bartlett High School FFA built an authentic replica of an 1860 stagecoach for the Bartlett Area Chamber of Commerce, bringing together business, education and history to create a working symbol of the pioneer spirit that Bartlett embodies from its original days. The population grew slowly during the first half of the 20th century, reaching 508 by 1960 and doubling in the next decade to 1,150. During the 1970's the population increased 1400% through growth and annexation, reaching 17,300 by 1980. The 1980's brought continued residential growth and an increase in business and industry to provide employment locally for new workers entering the labor force and for those workers who prefer to "stay in Bartlett". To establish an industrial base, in 1983 the City of Bartlett purchased and developed 100 acres of land on Highway 64 which is now Bartlett Corporate Park. By the end of 1986 all the land in the Park had been purchased, bringing eight new industries into Bartlett. Bartlett Corporate Park East has continued the expansion of industries, which totals 34 to date. Industrial growth in the 1990's has continued to bring new companies to the corporate parks, including the USDA Cotton Classing Division. Four new shopping centers have brought many new retail and service businesses. Residential growth averages 5% per year, and a reserve annexation area gives Bartlett room to expand as it grows. The newly constructed Appling Municipal Center which includes a middle school, a justice complex, a performing arts center and a second community center. Recreation is important to Bartlett citizens. There are fourteen neighborhood parks providing youth and adults activities throughout the year. A former school was renovated and converted into Singleton Community Center, with the majority of work and materials donated by citizens and civic organizations in Bartlett. A gymnasium was added in 1986. A public golf course and clubhouse opened in 1994. Bartlett continues to maintain a small town atmosphere though its population is growing. The business district along Stage Road has an old-fashioned flavor, and the corporate parks on the eastern edge of the City are separate from the residential areas. Bartlett offers its citizens the best of both worlds - a small town in a metropolitan area. 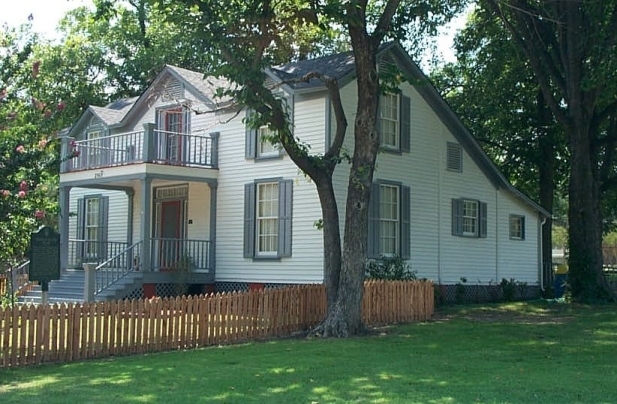 The Gotten House Museum, located at 2969 Court Street, was built by Nicholas Gotten in 1871 and restored by the Bartlett Historical Society. Artifacts, photographs, period furniture and written files on the history of Bartlett are on display. It is open the first and third Sundays from 2-4 p.m. with free admission.